I take pride in my carefully honed analytical abilities to assess the markets. I spend my weekdays - and parts of my weeknights and weekends - tracking various stocks, following indices, and generally, trying to further my educational abilities. It's something else I take pride in: knowing that my recommendations are working for so many of my readers and followers. On July 12, 2018, I published an article titled "10 Great REITs to Own for the Next 10 Years." It did quite well for itself that midsummer day, catching a good bit of attention over the next week as well. And why shouldn't it have when the markets were what they were last year? Investors were on the prowl for safety considering how things were going. It was an… interesting time for just about anyone with a U.S. company-filled portfolio. What words can we use to describe 2018? Aggravating. Sometimes in the extreme. On January 7, 2019, CNBC published a piece titled, "U.S. Stocks Post Worst Year in a Decade as the S&P 500 falls more than 6% in 2018." The previous week (and the last day of 2018), CNN ran with, "2018 Was the Worst for Stocks in 10 Years." These 5 Factors Shaped Investing in 2018. 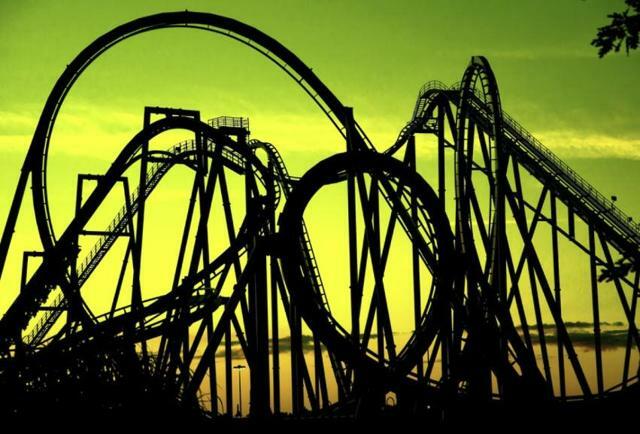 …a wild ride for investors, featuring the most ups and downs that the stock market has seen in quite some time. There have been plenty of reasons for that, and investors have had to get used to some new conditions that they haven't dealt with for quite a while. Specifically, the piece points out tax reform, China trade relations, the Fed, and a return to volatility after several years of more moderate moves. The final listed factor was the fickle finger of fate's decision to kick cryptocurrency down and build marijuana-affiliated stocks up in its place. Whether you agree with that top 5 list of most market-driving influences in 2018 or whether you think the article missed a thing or two, you no doubt agree that it wasn't a kick-back-and-relax kind of 12 months. Of course, that was the big-picture view at the very end of 2018. I published my 10 REITs article just halfway through. And, as usual, I published it without the benefit of a crystal ball to back me up. Now, for the record, I take pride in my carefully honed analytical abilities to assess the markets. I spend my weekdays - and parts of my weeknights and weekends - tracking various stocks, following indices, and generally trying to further my educational abilities concerning what the markets are capable of doing in the short term, mid-term and long term. Those efforts and that education are very valuable. There is many an investment portfolio out there to prove the validity of that statement. It's something else I take pride in: knowing that my recommendations are working for so many of my readers and followers. With that said, I'm not a market prophet. Nobody is. So nobody, no matter how educated and analytical they are, is going to be able to see everything coming. There are black swan events (the very opposite of our kind of SWANS that help you sleep well at night) and acts of God that seem to come out of nowhere, leaving our jaws on the floor and our brains scrambling to process what just happened. Then again, that's the point. The 10 companies I listed last year - and evaluate again down below - have survived a whole lot of "didn't see that coming" events already. They're strong, smart, savvy real estate businesses that don't play mind games with themselves or their investors. Knowing very well the unpredictability of life itself, they keep healthy balance sheets with notable savings stored away for rainy days and worse. This is hard to say these REITs are too good to fail. After all, who knows? A meteor could come falling out of the sky to land squarely on their headquarters, decimating the companies in question and their operations, and sending their stocks - and dividends - plunging into absolute obscurity. 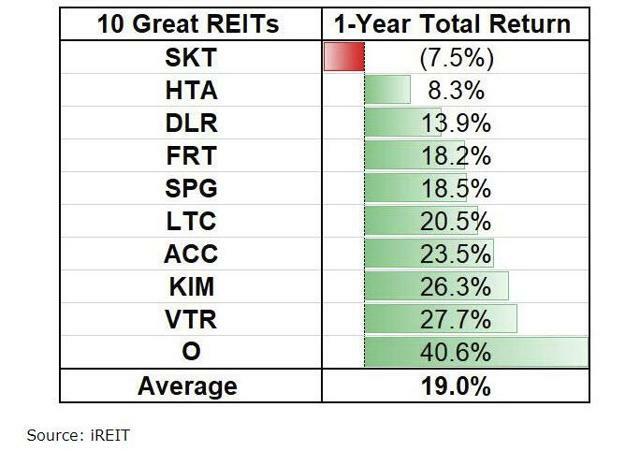 Considering the unlikelihood of such things happening, I'm pleased to bring back the 10 following REITs into the spotlight. Here's how they're doing these days. 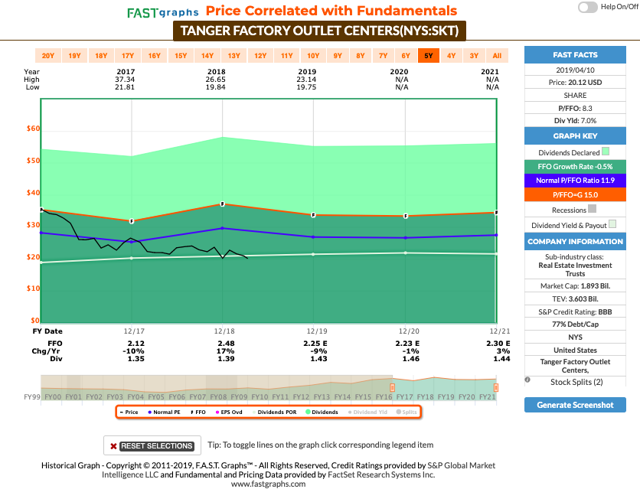 Tanger Outlets (SKT) is the worst-performing of the "10 REITs to own over the next 10 years" (returning -7.5% over 12 months). Although shares have struggled to recover (now trading at 8.3x P/FFO) we are bullish on the potential for enhanced price appreciation. More recently SKT unloaded four "non-core" assets for $131 million, resulting in a gain of approximately $44 million. The management team specifically mentioned paying down their line of credit and buying back common shares with the proceeds. 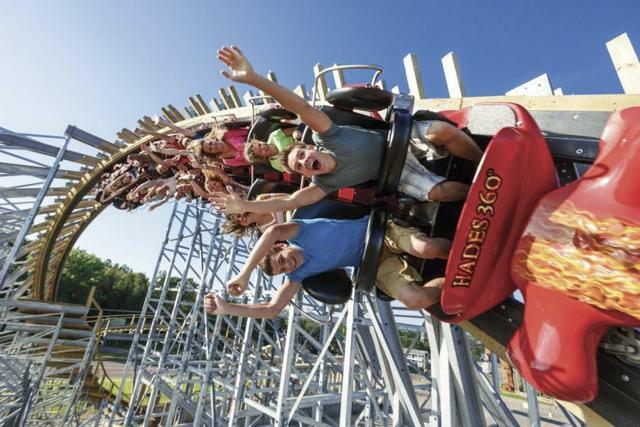 At $20 per share, Tanger can repurchase 6.55 million shares decreasing its dividend liability by $9.2 million annually and reducing shares outstanding by 7.0%. Tanger's management team continues to practice discipline as evidenced by the recent amendments on the unsecured lines of credit which included reducing its interest rate spread over LIBOR from 0.90% to 0.875%. The company's strong credit profile and lower leverage costs mean the overall return from paying down debt is more modest than buying back shares. More importantly, Tanger's dividend yield (now 7.0%) appears to be perfectly-aligned to capture both safety (best-in-class payout ratio of 60%) and attractive price appreciation. We are maintaining a Strong Buy. 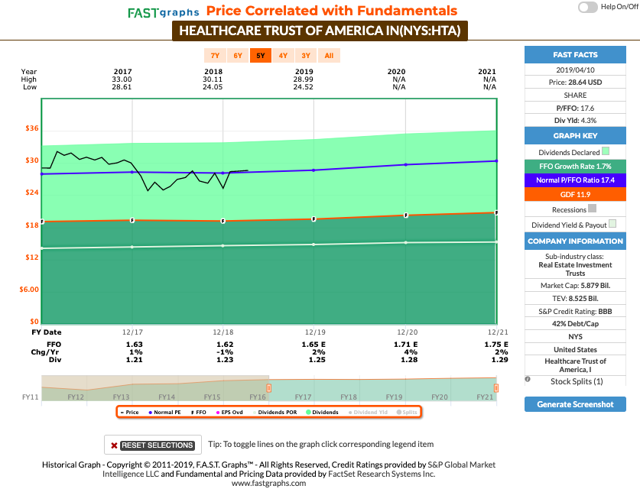 Healthcare Trust of America (HTA) is the second-worst performer on the "10 REITs to own over the next 10 years" list. 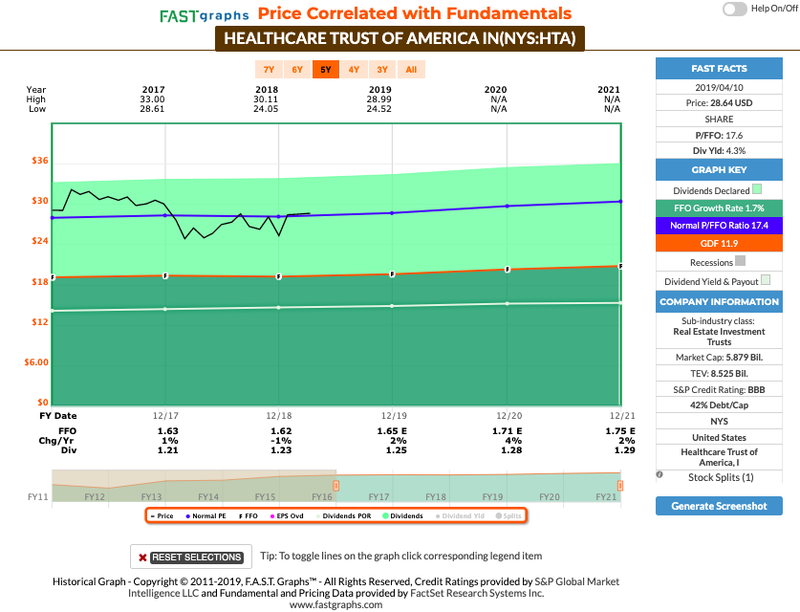 Of course, most health care REITs have traded down year-to-date ad we consider HTA to be one of the most attractive REITs in the sector, due primarily to the benefits from demographics that drive increased medical office building utilization. Health care fundamentals are strong as evidenced by the annual expenditures with the growing healthcare sector: 10,000 people turning 65 every day (4x as many physician visits as younger population), millennials are forming families, a key inflection point for healthcare volumes and the average lifespan will surpass 80 by 2020. HTA's investments are targeted to build critical mass in 20 to 25 leading gateway markets that generally have leading university and medical institutions, which translate to superior demographics, high-quality graduates, intellectual talent and job growth. The portfolio is powered by an optimized BBB-rated (by S&P) balance sheet with the lowest leverage that is seen in over the last two years (with $200 million of cash that hasn't been deployed into earnings assets). We believe HTA deserves a premium valuation (shares now trade at 17.6x P/FFO) and the 4.3% dividend yield is well-covered. We maintain a BUY. Digital Realty (DLR) has performed well year-to-date (+16.1%), yet this best-in-class data center REIT has more room to run. Over the years, DLR has continued to busily acquire more rivals as it consolidates the industry and expands its geographic presence. All told, the REIT has spent $14 billion over the past eight years, achieving the industry's second largest economies of scale. While economies of scale are important for all REITs, in its case, being one of the biggest consumers of electricity in any given market means DLR can cut great deals with electric utilities. Management believes that in 2019 and beyond, it can achieve about 6% to 9% long-term FFO/share growth. 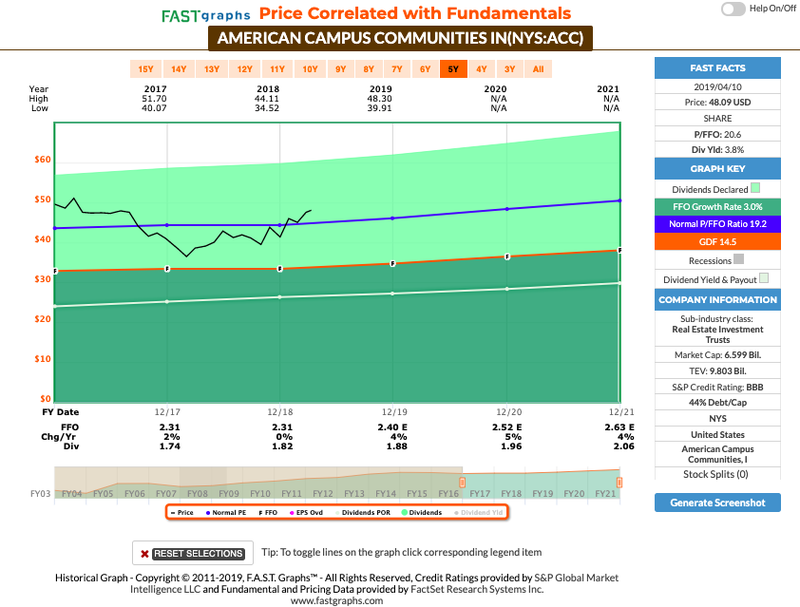 That should translate to dividend growth along the same lines: Yield is 3.5%, the AFFO Payout Ratio is 67%, and the valuation-Adjusted Total Return Potential is 9.5% (vs 2% to 8% for S&P 500). According to FactSet Research, analysts currently expect about 6% long-term cash flow growth, which, given today's nearly 4% yield, should result in close to 10% total returns in the coming years. 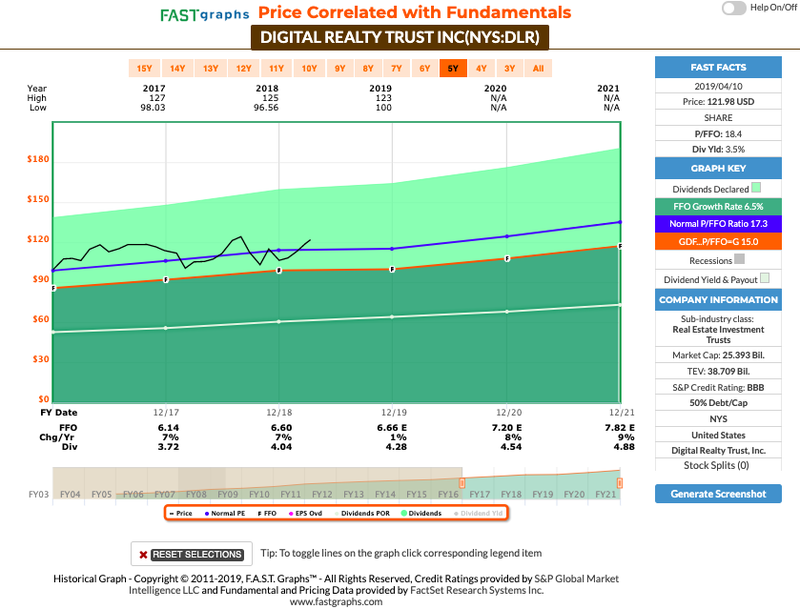 Digital Realty is trading at about fair value (based on its five-year average yield), which means that investors shouldn't expect to see much multiple expansion boosting future returns. But while high single-digit return potential might not sound like much, keep in mind that, according to Morningstar, most analysts and asset managers are expecting the S&P 500 to deliver between 2% and 8% CAGR total returns over the next five years. We maintain a BUY. 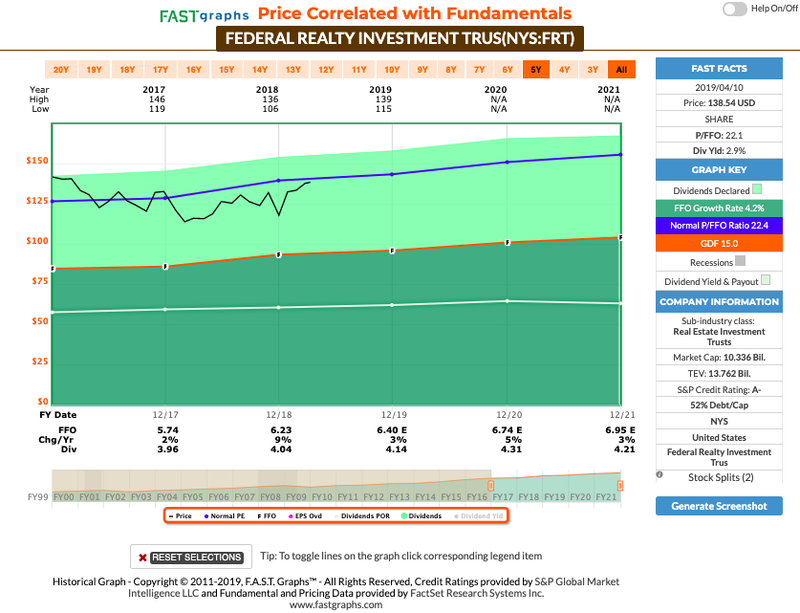 Federal Realty (FRT) has returned +17.9% year-to-date, signaling a strong recovery since the shares underperformed in 2018. In early January 2019, we forecasted FRT to return 25% in 2019 and it appears that the target is going to be met. Although FRT maintains a diverse revenue stream, it also has the greatest concentration (77.1%) of assets (compared with peers) in the nation's top 20 markets, which comprise 37% of US retail expenditures. FRT's demographics are unequaled with incomes that exceed the peer group by 32% and the national average by 50%. FRT's portfolio achieves the highest cash rents in the sector, ~60% higher than the peer group average (~$27.50 per sf). FRT is A- rating from S&P (also A3 with Moody's and A- with Fitch) and the balance sheet continues to improve and is very well-positioned from a capital perspective as they head into the next phases of new development in the coming years: net debt to EBITDA ratio moving lower to 5.4x, down from 5.9x at the start of 2018, the fixed charge coverage ratio is higher: 4.3x versus 3.9x at the start of the year. FRT reported full year 2018 results of $6.23 a share, 5.4% better for 2017. 2018 is the ninth year in a row that FRT has reported FFO increases over the prior year, the only shopping centers REIT to do so, as the fifteenth year of the past sixteenth that it's done so. The company forecasts FFO per share growth in the 6% to 8% range for 2019. We maintain a BUY. Simon Property Group (SPG) has returned 11.7% year-to-date and shares continue to trade below historical valuation ranges (current P/FFO is 15.1x). SPG's cost of capital is just 3.5% (courtesy of one of just two "A" credit ratings), which allows it to borrow massive amounts of money at very low interest rates. Also, SPG has access to revolving credit facilities with more than $7 billion in remaining liquidity - in case it wants to tap short-term credit markets to fund its growth. And not that Simon's in any need, generating $1.35 billion in annual retail adjusted funds from operations (operating cash flow minus maintenance costs). 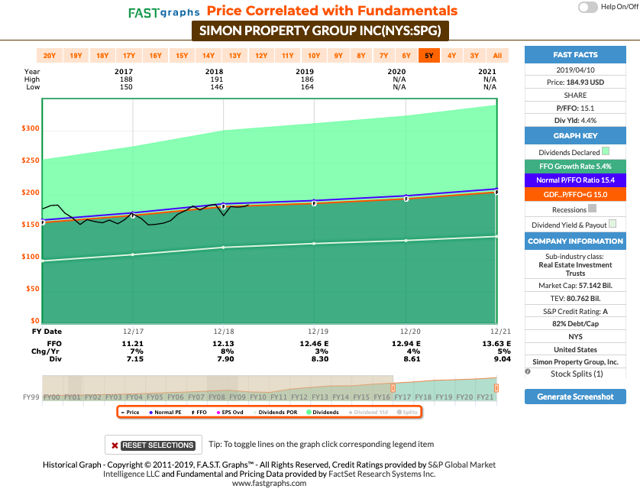 Core fundamentals are what long-term income investors track to know the health of the business, and all are excellent: For 2018, Simon's FFO per diluted share was $12.13, an increase of 8.2% year-over-year, at the high end of their peer group. Fourth quarter FFO was $1.15 billion or $3.23 per share, an increase of 3.5% year-over-year. More widely, the four-year per share FFO has grown at a compounded 8% annually. Showing Simon's stellar growth: Q4-18 average sales per square foot was a record $661, compared to $628 in the prior year period - an increase of 5.3%. Mall and premium outlet occupancy ended the quarter at 95.9%, up 40 basis points from Q3, and 30 basis points more than the prior year period. It's easy to see SPG's strong business approach produces results - given their commitment to strategy, active portfolio management, disciplined investment, relentless focus on operations, and cost structure. And with the current market pricing, SPG's clearly a strong buy. LTC Properties (LTC) owns a portfolio of 201 properties, three development projects and four land parcels (in 29 states) and has been around for more than 25 years (was incorporated on May 12, 1992). The company has a well-balanced geographic footprint, and Texas has the highest concentration (17.1%), followed by Michigan (14.1%) and Wisconsin (8.0%) (Michigan is the second-largest state for LTC, and that's due to the company's loan portfolio. 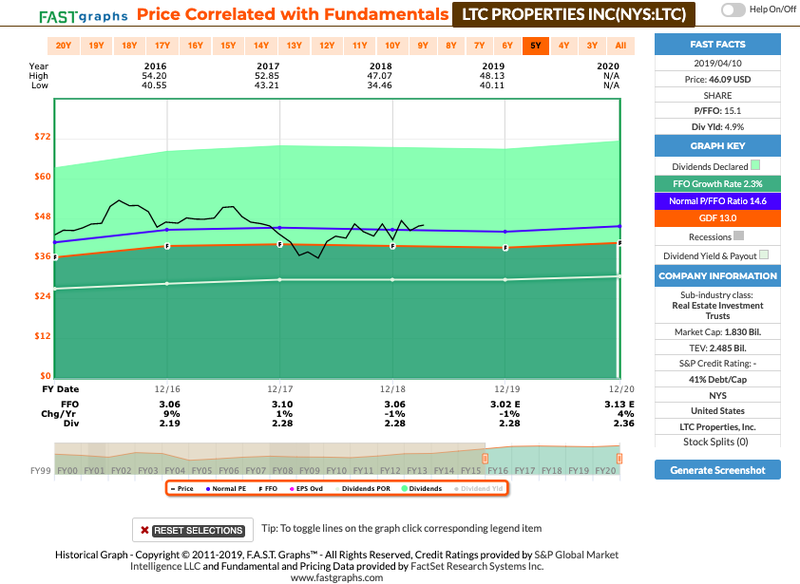 Like many skilled nursing REITs, LTC has not been immune to operator problems (i.e. Senior Care Centers, Thrive, and Anthem), and given the experienced leadership at LTC, the company has managed to navigate the turbulence quite well. In 2019, FFO per share is expected to be between $3.00 and $3.02 per share for the full year, which reflects a $0.03 reduction for Senior Care remaining on the cash basis. One of the keys to LTC's success has been its disciplined balance sheet that provides the company with substantial flexibility and the capacity to fund current and future growth initiatives. The company has $461.6 million available under its line of credit, $98 million under its shelf agreement with Prudential and $184.1 million under its ATM program, providing total liquidity of $743.7 million (as of Q4 2018). LTC did not increase the dividend in 2018, and the company continues to fund the $0.19 per share monthly dividend. The current dividend yield is 5.0%, and we maintain a BUY rating on the shares. American Campus Communities (ACC) is the only "pure play" campus housing REIT and the company is well-positioned to benefit from the sale-leaseback and build-to-suit opportunities that arise from the significant percentage of current housing stock that is physically and operationally outdated. According to Hoya Research, "the average age of dorm facilities at many universities exceeds 40 years, built for the boomer generation in an era where privacy, connectivity, and amenities in dormitories were afterthoughts. State or endowment funding for student housing is generally a tough sell to school boards and politicians when budgets are tight and it comes at the expense of other academic programs." In Q4-18 ACC's quarterly same-store property NOI increased by 0.1% on a 2.2% increase in revenues. For the full year 2018, same-store NOI increased 1%, on a 1.9% increase in revenue and a 3% increase in expenses. The company is well-capitalized with debt to enterprise value of 34.6%, debt to total asset value of 36.5% and net debt to run rate EBITDA of 6.3x. The company increased its line of credit from $700 million to $1 billion and the company successfully completed a JV partnership with Allianz which opened up another attractive source of capital to fund new development. For 2019 ACC provided an FFOM guidance range of $2.35 to $2.45 and same-store property NOI is expected to increase 1.6% to 3.4% driven by 2.3% to 2.9% revenue growth and 2.3% to 3.1% operating expense growth. Shares have returned 18.1% year-to-date (~25% since our Strong Buy initiation) and we maintain a BUY. Kimco Realty (KIM) has returned +26.6% year-to-date, validating the success of this Strong Buy recommendation. 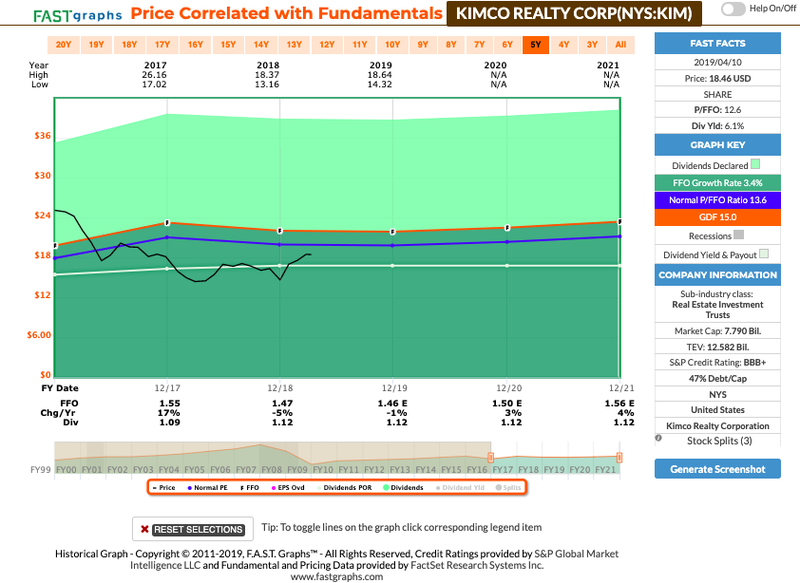 KIM has been actively recycling properties and, currently, the company has 437 properties across 76 million square feet of leasable space, primarily in the top 20 U.S. markets, which provide 80% of ABR (annualized base rent). Those markets project a population growth of 6.3 million within the next five years. Fourth quarter 2018 and year-end earnings results were solid, including 2018 pro-rata occupancy of 95.8%. In 2018, KIM completed several development and redevelopment projects, including its first large-scale Signature Series mixed-use development - and exceeded goals for dispositions. The balance sheet is in excellent shape, ending 2018 with consolidated net debt to recurring EBITDA of 6x. Total consolidated debt stands at $4.87 billion ($605 million lower than 2017), and no debt maturities in 2019. Liquidity is excellent with more than $2.1 billion in availability from the revolving credit facility and cash on hand. We expect KIM to deliver strong double-digit returns in 2019 and 2020 and even after the strong 2019 run-up, we maintain a Strong Buy. 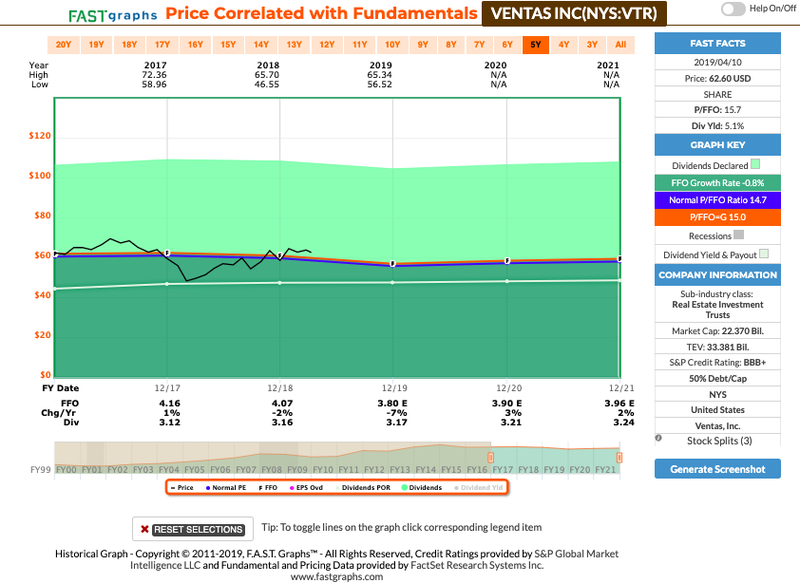 Ventas Inc. (VTR) was upgraded to a Strong Buy in April 2018 based on the belief that shares could generate outsized returns (25% annually). We pointed out that "intelligent investors should seek out the highest quality names with the highest-quality management teams. And, if you like home runs, Ventas is a grand slam." Although VTR has exposure to senior housing properties, we believe the superior locations (primarily coastal markets) and best-in-class operators mitigate demand concerns. Approximately 65% of SHOP NOI is in high-barrier-to-entry coastal markets in which median home values are 2.0x the national average (and median household income is 1.4x national average). As starts continue to moderate, demand for SHOP product ramped to its highest level ever in 2018. We anticipate a bottoming in senior housing so that the supply-demand equation moves in favor of VTR in the future, creating a powerful cyclical upside. Also, VTR's balance sheet is in the best shape ever: At year-end, net debt to adjusted EBITDA was 5.6x, fixed charge coverage was 4.6x, and debt to enterprise value was 34%. The company now has a war chest of liquidity, nearly $3 billion, and by aggressively reducing debt and extending maturities, we believe that the company is worthy of a credit upgrade (to A). Our Buy recommendation is centered around VTR's low cost of capital advantage and we are fairly certain that the company will be putting its balance sheet to work in the not-so-distant future, and the most likely targets will be life science, hospitals, or MOBs. We maintain a BUY. 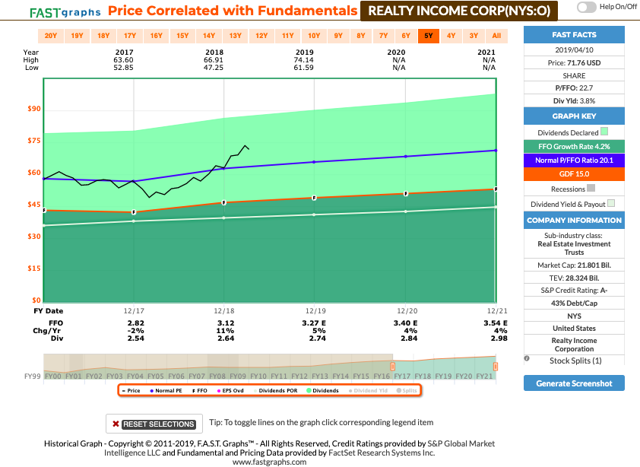 Realty Income (O) has returned over 14% year-to-date and given the current valuation (P/FFO of 22.7x) we are maintaining a Trim. As I explained in a recent article, we consider Realty Income the ultimate buy-and-hold REIT and we laid out our bull case "that over the last 20 years or so Realty Income's portfolio has evolved into a higher-quality business model that includes many well-known brands". The company has "steadily improved which industries its cash flow comes from, but also has increasingly focused on investment-grade tenants, with 67% of the most recent quarters worth of deals being investment-grade customers. As a result, the portfolio has the third highest tenant rental coverage ratio (operating cash flow/rent) in the industry." In addition, Realty Income's rock-solid balance sheet is a testament to the company's conservative use of debt as well as its mastery of using its shares as growth currency when they trade at a premium. This allows the company to retain its borrowing power (including $2.4 billion in liquidity under its revolving credit facilities) for times when its share price is low and its cash cost of equity (AFFO yield) is high (like in February 2018 at the bottom of the last REIT bear market). Don't be confused, we are trimming shares as part of our official recommendation, but it's highly likely that we will maintain over-weight exposure for years and years. There is no reason to sell a blue-chip that delivers consistent results and we expect to see this REIT as a top-performer when we summarize results nine years from now. The secret to successful investing is to pick more winners than losers. When prices are generally rising, greed leads investors to yield chasing or speculating in order to make substantial, high-risk bets based upon optimistic predictions. It's during that time that investors begin to focus on higher risk REITs. "To buy when others are despondently selling and sell when others are greedily buying requires the greatest fortitude and pays the greatest ultimate rewards." Disclosure: I am/we are long SKT, HTA, DLR, FRT, SPG, LTC, ACC, KIM, VTR, O. I wrote this article myself, and it expresses my own opinions. I am not receiving compensation for it (other than from Seeking Alpha). I have no business relationship with any company whose stock is mentioned in this article.